"Manic depression" redirects here. For other uses, see Manic depression (disambiguation). Bipolar disorder, also known as manic depression,is a psychiatric diagnosis that describes a category of mood disorders defined by the presence of one or more episodes of abnormally elevated mood clinically referred to as mania or, if milder, hypomania. Individuals who experience manic episodes also commonly experience depressive episodes or symptoms, or mixed episodes in which features of both mania and depression are present at the same time. These episodes are usually separated by periods of "normal" mood, but in some individuals, depression and mania may rapidly alternate, known as rapid cycling. Extreme manic episodes can sometimes lead to psychotic symptoms such as delusions and hallucinations. The disorder has been subdivided into bipolar I, bipolar II, cyclothymia, and other types, based on the nature and severity of mood episodes experienced; the range is often described as the bipolar spectrum. Data from the United States on lifetime prevalence vary but indicate a rate of around 1 percent for Bipolar I, 0.5 to 1 percent for Bipolar II or cyclothymia, and between 2 and 5 percent for subthreshold cases meeting some but not all criteria. The onset of full symptoms generally occurs in late adolescence or young adulthood. Diagnosis is based on the person's self-reported experiences, as well as observed behavior. Episodes of abnormality are associated with distress and disruption, and an elevated risk of suicide, especially during depressive episodes. In some cases it can be a devastating long-lasting disorder; in others it has also been associated with creativity, goal striving and positive achievements. Genetic factors contribute substantially to the likelihood of developing bipolar disorder, and environmental factors are also implicated. Bipolar disorder is often treated with mood stabilizer medications, and sometimes other psychiatric drugs. Psychotherapy also has a role, often when there has been some recovery of stability. In serious cases in which there is a risk of harm to oneself or others involuntary commitment may be used; these cases generally involve severe manic episodes with dangerous behavior or depressive episodes with suicidal ideation. There are widespread problems with social stigma, stereotypes and prejudice against individuals with a diagnosis of bipolar disorder. People with bipolar disorder exhibiting psychotic symptoms can sometimes be misdiagnosed as suffering from schizophrenia, another serious mental illness. Also called manic depression or bipolar affective disorder, the current term "bipolar disorder" is of fairly recent origin and refers to the cycling between high and low episodes (poles). A relationship between mania and melancholia had long been observed, although the basis of the current conceptualisation can be traced back to French psychiatrists in the 1850s. The term "manic-depressive illness" or psychosis was coined by German psychiatrist Emil Kraepelin in the late nineteenth century, originally referring to all kinds of mood disorder. German psychiatrist Karl Leonhard split the classification again in 1957, employing the terms unipolar disorder (major depressive disorder) and bipolar disorder. Why is bipolar disorder called an “illness”? Everyone has ups and downs in mood. Feeling happy, sad and angry is normal. Bipolar disorder, or manic-depressive illness, is a medical condition in which people have extreme mood swings. Their moods may have nothing to do with things going on in their lives. These swings do not only affect mood, they also affect how people think, behave and function. Bipolar disorder is no one’s fault. It does not come from a “weak” or unstable personality. It is a medical disorder that can be treated. You or someone you care about may have been diagnosed with bipolar disorder. You may now feel alone in facing the problems of the illness, but you are not alone. About one to two per cent of adults worldwide suffer from bipolar disorder. Men and women are affected equally. More and more, the first signs of bipolar disorder are being recognized in adolescence or early adulthood. Yet the younger the person is when the symptoms first develop, the less typical the symptoms may be. The symptoms may then be mistaken for teenage distress or rebellion, so bipolar disorder is often not diagnosed until adulthood. In some women, bipolar disorder may appear during pregnancy or shortly after it. Mania, or a “high,” after pregnancy occurs only in about 0.1 per cent of all cases. Depression is more common (see symptoms of mania and depression). If you or someone you care about has developed depressive symptoms after pregnancy, and these symptoms are severe or last more than two weeks, you or she should seek help. a well state, during which many people feel normal and function well. The manias and depressions may be either “pure” episodes (they have only typical manic or depressive symptoms) or they may be “mixed” episodes (they may consist of a mixture of manic and depressive symptoms at the same time). Traditionally, mixed episodes have been associated with the manic phase of the illness, so terms such as “mixed mania” or “dysphoric mania” are often used to describe mixed states. Some people experience manic or mixed, depressed and well phases during their illness. Such people are said to have “Bipolar-I” disorder. A milder form of mania is called “hypomania.” People who have hypomania, depression and intervals without symptoms, but no full manic phases, are said to have “Bipolar-II” disorder. The manic/hypomanic, mixed and depressive states usually do not occur in a certain order, and their frequency cannot be predicted. For many people there are years between each episode, whereas others suffer more frequent episodes. Over a lifetime, the average person with bipolar illness experiences about 10 episodes of depression and mania/hypomania or mixed states. As the person ages, the episodes of illness come closer together. Untreated manias often last for two to three months. Untreated depressions usually last longer, between four and six months. In about 20 per cent of cases, patients have four or more (sometimes many more) episodes a year, and have short phases without symptoms. Patients with four or more episodes a year are said to be having rapid cycling, which is a subtype of bipolar disorder that needs specific treatment. We don’t know for certain what causes rapid cycling. Sometimes, its course may be triggered by certain antidepressants, but how the antidepressant causes rapid cycling is not clear. Sometimes stopping the antidepressant may help the patient to return to a “normal” cycling pattern. Sometimes, a person may seem abnormally and continuously high, irritable or expansive for at least one week. If this change in mood is accompanied by other symptoms (see below) the person may be in a manic phase of the bipolar illness. Not everybody who enters a manic phase feels happy or euphoric. Instead, a person may feel very irritable, or may be terribly angry, disruptive and aggressive. People feel invincible or all powerful; they believe they understand “how the world works” or how to save it. They may feel they have a special mission in life (that is, God has sent them or given them special powers). People feel rested after just a few hours of sleep. Sometimes they may not sleep at all for a few days or even weeks. People may talk very quickly, too loudly and much more than usual. They may like to tell jokes or rhyme words and may become angry when interrupted. They may keep switching topics and cannot converse properly with others. People easily lose their train of thought, and have trouble interacting because they are easily distracted. They may be impatient with others who cannot follow their fast thinking and changing plans and ideas. People may socialize more than usual at work or school, or may be much more active, with seemingly boundless energy. In the early manic phase, they may be productive, but as symptoms worsen, people are more frantic in their activities and start but do not finish many projects. People may not be able to control or plan how they act. They may take part in unusual and risky activities without realizing harmful consequences (e.g., shopping sprees, bad business choices and bad decisions). They may feel more sexual, become more sexually active and take less care in choosing their sexual partners. This increased sexual activity may lead to unwanted pregnancies, sexually transmitted diseases, guilt and disrupted relationships. People may experience delusions, or beliefs that are not based in reality. They may hallucinate - most often, they hear voices. The symptoms of hypomania are less severe than those of mania, but may still be disruptive. People may feel happy and have lots of energy, but do not usually get into serious trouble. Hypomania may progress to a full-blown manic episode or a severe depression, and therefore needs treatment. Some patients do not always have “pure” manic or depressive episodes. Instead, they may experience episodes in which manic and depressive symptoms occur at the same time. This is called a “mixed state.” For example, someone in a mixed state can think and speak very rapidly. At the same time, the person may be very anxious and have suicidal thoughts. Mixed states are hard to diagnose and are very painful for the individual. The mood state in depression differs substantially from normal sadness. In fact, many depressed people say they cannot feel sadness, and many people cannot cry when depressed. Being able to cry again often means the depression is improving. When people have just begun to feel depressed or are mildly depressed, they can still enjoy things, and may also be distracted by pleasurable activities. When people are severely depressed, they lose these abilities. Many people lose weight when depressed, partly because they lose their appetite. However, one subgroup of patients feels hungrier, and may develop a craving for carbohydrate-rich and fatty foods. This results in weight gain. Metabolism may also increase or slow down, depending on the type of depression; such changes in metabolism can cause either weight loss or weight gain. Many people with depression develop slowed-down movement, speech or thinking. In severe cases, depressed people may be unable to move, speak and respond to their environment. In some people, the opposite happens, and they are very agitated. They are tormented by a severe inner restlessness - they cannot sit still, they pace, they may wring their hands. They may also show in other ways that they are agitated. Patients who feel agitated often feel very anxious, too. Depressed individuals find it hard to complete everyday chores. It takes them longer to perform at work or at home because they lack energy and drive. When depressed, individuals may lack self-confidence. They may not assert themselves, and they may be overwhelmed by feelings of worthlessness. Many people cannot stop thinking about past events. They obsess about having let others down or having said the wrong things - and they feel very guilty. In severe cases, the guilt may cause delusions; that is, people feel sure that they have sinned and need to be punished for their wrong-doings. Or they may believe that God is punishing them for their past mistakes. These symptoms may be so bad that people cannot do simple tasks. They may have trouble deciding on very small matters. Depressed people often think that life is not worth living or that they would be better off dead. The risk of acting upon these thoughts is high, and many people do try to commit suicide when depressed. These may include false beliefs about poverty or punishment for past sins. People may believe that they have a deadly disease, such as cancer. They may also hear voices (auditory hallucinations) or may see things that do not exist (visual hallucinations). many visits to the family doctor for various physical symptoms. Some patients with bipolar disorder may have problems with movement during their episodes. These disturbances of movement (motor symptoms) occur in up to 25 per cent of depressed patients and up to 28 per cent of patients with mixed or pure manic episodes. These motor problems are called “catatonic symptoms.” Such symptoms vary and may include extreme physical agitation or slowness and odd movements or postures. Patients can’t be slowed down or, on the other hand, they may move so little that they even refuse to open their mouth to eat, drink or speak. This is a serious risk to their physical health. In most cases, patients become free of catatonic symptoms after specific treatment. There is a risk that people who exhibit catatonic symptoms may be misdiagnosed, because catatonic symptoms have been traditionally associated with schizophrenia, rather than bipolar disorder. A “comorbid disorder” is an illness or medical condition that occurs together with another illness or medical condition. Comorbid conditions can occur with bipolar disorder - they can start either before a bipolar illness or at the same time. Experts do not know why some disorders co-occur frequently with bipolar disorder and others do not. The severity of the comorbid condition may change over a lifetime, and its symptoms may also vary as the bipolar disorder changes. For example, one of the most common comorbid conditions is drug or alcohol abuse. People with an alcohol problem may drink too much during mania, or they may experiment with drugs, because they feel free and they are impulsive. They may also drink or do drugs during depressive phases, because alcohol or drugs help them to feel less depressed. The same people may not abuse alcohol or drugs during their well phase. It is important to diagnose comorbidity in bipolar disorder. Comorbid conditions may cloud the clinical picture and complicate treatment of bipolar disorder. Also, the comorbid conditions are often so severe that they too need treating. Several factors are involved in causing bipolar disorder, and the precise mechanism is not known. However, there is strong evidence that biological, including genetic, factors play an important role. This does not mean that a person has to inherit the genes: the genes involved may be altered when a person is conceived. We do know that too much stress or difficult family relationships do not cause the illness. However, these factors may “trigger” an episode in someone who already has the illness. Nor is bipolar illness a simple imbalance of neurotransmitters, such as serotonin or dopamine. Yet neurotransmitters may be affected during a flare-up of the illness. What Is a “Trigger” for a Bipolar Episode? Not all episodes can be related to any particular trigger, but many can. Triggers are situations that can provoke either mania or depression in someone who has already had an episode of illness. Feeling very stressed or continually losing sleep is an example of this kind of trigger. Other triggers are chemical, and include antidepressants that work “too well” and result in mania; common medications, such as steroids (for instance, prednisone used for treating asthma, arthritis, etc. ); and street drugs, such as cocaine and amphetamines. Treatment of bipolar disorder includes biological treatments (medications) and psychosocial treatments (psychotherapy, rehabilitation). Often both types of treatment are needed, but usually biological treatment is needed first to bring symptoms under control. Because bipolar disorder is a biological illness, the main forms of treatment are biological. These consist mainly of medications, but also include other treatments, such as electroconvulsive therapy (ECT) and light therapy. Medications fall into two broad categories - mood stabilizers and adjunct medications. Mood stabilizers are medicines that help reduce swings in abnormal moods. They also help prevent fresh mood episodes. The first, and most studied, of these is lithium, a naturally occurring salt that has been used for 50 years. Lithium still has a major role in bipolar disorder. Carbamazepine, a medicine first used for epilepsy as an anticonvulsant, is used occasionally. It was found to be a mood stabilizer in the 1970s. Valproic acid (also including its various forms of sodium valproate and divalproex sodium) is another anticonvulsant that has become widely used in the 1990s to stabilize moods. It is used so often because many doctors feel it helps more types of mood swings and symptoms than lithium, and has fewer side-effects than lithium. However, all of the newer treatments are not necessarily “better” simply because they are newer. For some patients, lithium may be the most effective treatment. Adjunct medications are simply other medications that can be used to treat specific symptoms, for example, depression, poor sleep, anxiety and psychotic symptoms. Adjunct medications include antidepressants, anti-anxiety medications, and antipsychotics, or “neuroleptics.” These medications are often only used for the short term. In contrast, mood stabilizers are used for the long term. Antidepressants are medications that were originally found to be useful in treating depression, and more recently have often been found helpful to treat anxiety disorders. The first antidepressant was discovered by accident: patients with tuberculosis in the 1950s were often treated with iproniazid, which was found to elevate mood. Later research resulted in the development of tricyclic antidepressants such as imipramine (Tofranil®) and amitriptyiline (Elavil®). These were followed by fluoxetine (Prozac®), the first of the “new” antidepressants, in the 1980s. Currently, there are over 40 antidepressants available, spanning many different classes of medications. Antidepressants are thought to work primarily by affecting the concentration of neurotransmitters in the brain. Key neurotransmitters that are affected include serotonin, norepinephrine, and dopamine. While antidepressants can be used in bipolar disorder during depression episodes, they must be used with caution since they can also cause a switch into mania and may precipitate a cycle of frequent mood episodes (rapid cycling). Anxiety is common in bipolar disorder. Sleep disturbance is also very frequent during an acute episode. Benzodiazepines, a family of medications (the most well known is Valium®) with mild sedating ability, are often prescribed - particularly lorazepam (Ativan®) and clonazepam (Rivotril®). These may be used for short periods without the patient becoming addicted. Clonazepam is particularly useful for treating the excessive energy and reduced sleep of hypomania. For more severe anxiety problems, such as panic attacks, a special type of psychotherapy, known as cognitive behaviour therapy, may be very helpful. It may, in fact, be needed, because the antidepressants that are also sometimes used to treat anxiety disorders may provoke manic episodes. Antipsychotic medications are commonly used in bipolar disorder. These medications have powerful sedating effects, which help control mania, and can treat psychotic symptoms. Such symptoms may include delusions of grandeur or persecution, and hallucinations. Traditional antipsychotics, such as haloperidol and loxapine, can also prevent new episodes of mania, but their long-term use may bring serious side-effects, such as tardive dyskinesia, a movement disorder. Newer antipsychotics are also proving useful in bipolar disorder. These include olanzapine (Zyprexa®), risperidone (Risperdal®), quetiapine (Seroquel®), and clozapine (Clozaril®). The new drugs may work to some extent like mood stabilizers. Research continues to see if these medications can treat not only mania but also depression, and prevent new episodes. These newer medications have fewer side-effects than the old antipsychotics. Many of the newest medications in bipolar disorder were first developed as anticonvulsants - medications used to treat epilepsy. Most of these are now systematically being tested in clinical trials with bipolar patients. Carbamazepine and valproic acid, both regular mood stabilizers, were developed in this way. Most recently, the novel anticonvulsant lamotrigine (Lamictal®) has proved effective in bipolar depression and useful in rapid-cycling bipolar disorder, and may become a very common treatment. Gabapentin (Neuroatim®) and topiramate (Topamax®) are newer anticonvulsants with some usefulness in treating bipolar disorder. However, to date, no major studies on these medications have been published. It is helpful to ask your doctor about new and emerging treatments in bipolar disorder. In some university medical centres, it is also possible to participate in clinical trials of new treatments. “Natural” remedies may have a role. These include fish oil and inosital, a type of sugar. Yet when these products are sold through health food stores, they are often unreliable. Because they have not been precisely formulated, they cannot be recommended. Furthermore, little research has been done on these products. St. John’s wort has been well studied in unipolar depression (depression without mania). However, it has not been studied in bipolar disorder. Electroconvulsive therapy (ECT) is perhaps the most controversial and misunderstood of psychiatric treatments, due in part to sensationalized and misleading depictions of the treatment in the popular media. In fact, ECT is a highly effective and safe treatment for both the depressive and manic phases of bipolar disorder, and is sometimes used as a long-term “maintenance” treatment to prevent recurrence of illness after recovery. ECT involves administering a brief electrical stimulus through the scalp to the surface of the brain. This stimulus produces an epileptic-type convulsion, lasting typically from 15 seconds to two minutes. During the treatment, a team of psychiatrist, anaesthetist and one or more nurses are present. The patient is given an anaesthetic intravenously to put him or her to sleep briefly during the treatment. A muscle relaxant is also given to prevent physical injury, by lessening the intensity of muscle spasms that accompany a seizure. Oxygen is administered and heart rate and blood pressure are monitored. Although the anaesthetic lasts only a few minutes, patients feel groggy after an ECT treatment and may rest or sleep for about one hour. Usually the treatments are administered three times a week over three to four weeks, for a total of eight to 12 treatments. For longer-term maintenance treatment, the treatments may be spread out, for example, once a month, and continued for as long as the patient and doctor feel is appropriate. ECT is usually given to hospitalized inpatients, but outpatients can receive ECT as well. Patients may have a headache or jaw pain on awakening after ECT, usually requiring only a mild pain killer such as acetaminophen (Tylenol®). Some loss of recent memory or problems with concentration usually occur during treatment (for example patients may not recall what they had for supper the night before the treatment), but these symptoms improve quickly after the course of ECT is finished, over a few weeks. Some patients report mild memory problems persisting much longer after ECT, but this is likely due to their depression, not to the treatment. ECT can be given bilaterally (the electric current is applied to both sides of the brain) or unilaterally (only on the right side of the brain). Although bilateral ECT causes more memory disruption than unilateral ECT, it is also somewhat more effective and is usually the preferred choice. ECT is the most effective, and possibly the fastest-acting treatment for severe depression, and is particularly helpful for highly agitated or suicidal patients or those with psychotic or catatonic symptoms. Some patients receive ECT early in their episode of illness because of the urgency of their situation or their particular symptoms, while others may prefer to use ECT only after various medications have failed. ECT works well for severe mania as well. While ECT is highly effective at ending an episode of depression or mania, the benefits may not last more than a few weeks or months following treatment. Therefore, patients usually start or continue treatment with mood stabilizers and/or other medication following a course of ECT. Maintenance ECT can be used in cases where medications have not prevented recurrence of illness, or are intolerable due to side-effects. Finally, there is transcranial magnetic stimulation (TMS). TMS is a treatment involving magnetic pulses to the brain. TMS is being tested, but its effectiveness has not yet been proven. Psychosocial treatments include psychoeducation, psychotherapy, support groups and rehabilitation. Psychoeducation is a specific term for health education for psychiatric illnesses. All new patients should be routinely treated with psychoeducation. It can also be helpful to give patients psychoeducation periodically throughout their illness. Psychoeducation teaches what causes the illness, how to treat it, how to self-manage the illness to some extent, and how to prevent future episodes. Psychotherapy is a general term used to describe a form of treatment that is based on “talking work” done with a therapist. The aim is to relieve distress by discussing and expressing feelings, to help change attitudes, behaviour and habits that may be unhelpful, and to promote more constructive and adaptive ways of coping. Successful psychotherapy depends on a supportive, comfortable relationship with a trusted therapist. Doctors, social workers, psychologists and other mental health professionals are trained in various models of psychotherapy and work in hospitals, clinics and private practice. There are many different models of psychotherapy. They fall into two general categories. Short-term structured psychotherapy and long-term psychotherapy. Short-term therapy has a specific focus and the therapist is active and directs the process. On average, the treatment lasts for between 10 and 20 sessions. In long-term therapy the therapist is generally less active and the process is less structured. This treatment usually lasts for a year or more. The aim is to facilitate the patient coming up with his or her own answers. Psychotherapy is a very helpful treatment. For bipolar disorder, though, it only works as an add-on to medications, not as a substitute. Every patient should get some supportive therapy that involves not only managing medication, but also dealing with the various problems that a person with bipolar disorder may experience. Practical suggestions and emotional support are the main features of supportive therapy. Cognitive behaviour therapy is an example of a short-term structured psychotherapy that has worked well for many other disorders. It is based on the idea that deeply held beliefs or thoughts influence how we look at ourselves and the world, and have a strong influence on our mood and behaviour. For instance, if we are depressed and think no treatment will help, then we might not bother to seek treatment. This almost guarantees that we will feel worse. Cognitive therapy attempts to identify and change such thoughts and to improve mood and functioning. It is now being tested in bipolar disorder. The early results are promising, both in preventing future episodes and in treating depression. Insight-oriented or psychodynamic psychotherapy is an example of a long-term, unstructured psychotherapy. This therapy reduces distress by helping an individual to gain insight into the underlying motives of his or her overall behaviour. While this is not a specific treatment for bipolar disorder, it can be very helpful as increased self- knowledge and awareness leads to more effective management of the illness. Historically, group therapy has been used successfully to provide elements of support and psychoeducation. Cognitive therapy may also be provided in a group. However, group cognitive therapy has not yet been tested with bipolar patients. Finally, family and couple therapy can be very helpful in addressing problems that may have existed before the illness and have become highlighted, or to deal with issues that have arisen as a result of the illness. The timing, however, is of utmost importance. During an acute episode, the family or spouse should be given only support and education. Formal family or marital therapy should wait until the patient is more stable. Self-help support groups can be very important to treatment. A group of people who all have bipolar disorder can accept and understand one another, and can share their struggles in a safe, supportive environment. A strong bond usually develops among group members for the reasons just stated. People who have recently been diagnosed with bipolar disorder can benefit from others who have learned successful coping strategies for managing the illness. These groups are usually organized under the auspices of the local chapters of the Mood Disorders Association (see "Resources" for additional information). During severe episodes of depression or mania, patients with bipolar disorder may need to be hospitalized. Hospitalization is needed if the illness is out of control and putting patients at risk of serious consequences, for example, due to aggressive behaviour, risk-taking, failing to look after their own basic needs, or suicidal tendencies. Patients are usually admitted to hospital voluntarily. This means that they are free to leave hospital at any time if they so choose. However, in Ontario, as in most other jurisdictions, the law also allows any doctor (not just a psychiatrist) to admit a patient to hospital involuntarily (sometimes called “certifying” the patient). This can happen if the doctor believes there is a serious risk of the patient or someone else being physically harmed because of the patient’s disorder. If no doctor has seen the patient, families also have the option of asking a justice of the peace to order a psychiatric assessment, and must provide convincing evidence that the patient's illness represents a danger to the patient or others. Legal safeguards are in place to protect the involuntary patient’s rights. For instance, a “rights advisor” will visit and ensure that the patient has the chance to appeal the involuntary status before an independent board of lawyers, doctors and lay-persons, if the patient wishes. A typical hospital stay may be anywhere from a few days up to several weeks, and rarely, several months. Usually patients are expected (or required, if they are involuntary) to remain on the psychiatric unit for the first few days of their stay. As they recover they may be granted increasing privileges to visit other parts of the hospital or to walk outside. Later they will be given passes to go home overnight or for the weekend. Patients participate in a variety of group educational and therapeutic programs during the day or evening and also have individual sessions with medical, nursing and other professional staff. Medications may be changed or doses adjusted, and families may be interviewed by medical or social work or other staff. Discharge planning begins immediately following admission to hospital. Patients should expect to leave hospital as soon as reasonable follow-up arrangements are in place and their symptoms have improved enough to ensure they are able to function safely and care for themselves at home. Staying in hospital after symptoms have improved may not benefit the patient. It may in fact cause difficulties, by reducing the patient’s connection to family and social supports and possibly undermining his or her independent living skills. Some people may recover quickly from a manic, hypo-manic, mixed or depressive episode. For many others, it is more gradual. Often, it takes a few months for a person’s functioning to return to familiar levels. This may be true even if symptoms of the most recent episode have been fully eliminated. The time needed to recover often frustrates people with bipolar disorder. Health care providers often need to clarify the recovery phase for patients, their families and employers. A person recovering from a broken leg would increase activities gradually. Similarly, gradually increasing activities after a bipolar episode is advised. This approach allows people to take on responsibilities and build self-confidence more manageably. Some individuals rush back into full, if not increased, activities. They may be trying to convince themselves and others that they are fully recovered. This “flight into health” often exhausts and defeats people. Many individuals who expect a lot of themselves are unhappy with how slowly they recover. They feel demoralized by the delay. Recovery is a process that takes time. After a bipolar episode, people often feel fragile, vulnerable and at risk of more episodes. These feelings are a normal part of the recovery phase. It takes some time before a person’s confidence and performance return to normal. A social worker, occupational therapist or nurse can help plan a strategy for recovery. This strategy may include a balance of volunteer activities, leisure interests, school courses and work activities that reflect a person’s abilities. Is a Person Who Has Recovered “Cured”? Unfortunately, at this time there is no cure for bipolar disorder. Like a chronic medical disorder, such as hypertension or diabetes, bipolar disorder can be effectively managed and controlled by combining a healthy lifestyle and treatments. Medications are the cornerstone of treatment in bipolar disorder. That is, they are needed to restore and promote wellness. There are several medications commonly prescribed for bipolar disorder. Finding the right dose for you will require monitoring and discussion with your physicians. The purpose of taking medications is to eliminate your symptoms and prevent their return. How long should a person stay on medications? Bipolar disorder is a highly recurrent, or returning, disorder. Most people who are untreated will experience a relapse within a couple of years. Medications not only treat symptoms but also prevent their return. People are much more likely to stay well if they remain on medications rather than stop them. Recommendations for maintenance, or longer-term, treatment depend on the type of illness. For some, staying on medications for one or two years may work. This strategy suits only people who have a mild single episode that is not very impairing. For most other individuals, longer-term treatments are recommended. In many cases, treatment may be needed indefinitely. If a person is well for a long time, does that mean medication is no longer needed? No, it is possible that the illness has entered into a quiet period. Or it may imply that the medication is working at preventing symptoms. If the person then stops the treatment, the risk of relapse is high: there is more than an 80 per cent risk of relapse within two years. Relapse may occur even after many years of stability. Is there a chance of becoming addicted to medications? And can they change personality? No, people do not become addicted to the main treatments for bipolar disorder. These are mood stabilizers, antidepressants and anti-psychotics. There is no evidence at this time that these medications change personality. However, caution is warranted with some anti-anxiety drugs, such as benzodiazepines, if taken for a long period of time. Do medication side-effects go away if a person takes medication for a long time? Many side-effects from medication do lessen with time. Other side-effects can be relieved with help from a physician. A physician will monitor not only the side-effects but also the medication dose. In some cases, the physician will monitor the blood level of medication and body organ functioning. With these checks in place, the risk for long-term physical complications from the medications is low. The risks of living with untreated bipolar disorder are much greater. Many, but not all, people with bipolar disorder can benefit from counselling, psychotherapy or meeting with an occupational therapist, social worker or nurse. Using such resources can help to find coping strategies to reduce symptoms, effectively cope with day-to-day stress and lower the risk of recurrence. Health care providers should recommend treatment tailored to each individual. Become an expert on your illness. Ask your treatment provider about the illness and its treatment. Many resources are available. These include books, videos, support groups and information on the Internet. The quality of information varies. Ask your treatment team to recommend good sources. Live a healthy lifestyle. Do not use alcohol and drugs. They increase your risk of relapse of the illness. Eat a healthy diet. Research has shown that exercising regularly can positively affect mood. Develop healthy sleep habits. Watch sleep patterns, particularly when travelling, taking holidays or working long hours. Try to go to bed at the same time each night. Avoid stimulating activities close to bedtime. Plan on paying bills, completing work or having important talks earlier in the evening, or, better still, during the daytime. You can’t get rid of stress, so find better strategies to cope with stress. Many individuals use only one coping strategy. Work with your treatment team to identify strategies to more effectively cope with day-to-day stress. Avoid isolating yourself. Some individuals with bipolar disorder tend to spend too much time alone. This can add to their feeling depressed, demoralized and sad. A strong social network can be a big support. It can act as a buffer against stressors, or situations that cause stress. Try to balance your life. Remember, moderation is key. Divide your time among work, family, friends and leisure activities. A more balanced and satisfying lifestyle can help you effectively cope with stress. It may reduce your risk of relapse. Monitor your symptoms closely. Many people with bipolar disorder have a signature pattern of symptoms. That is, their symptoms seem to be similar across episodes. For example, some people have learned to recognize the early phase of an impending relapse. Signs may include: needing less sleep, becoming irritable or feeling that medication is not needed. Monitoring such signs closely and seeking medical attention can effectively stop a full-blown episode. Often, a mood diary can help. Most people experience a variety of feelings - not all shifts in your mood are due to bipolar disorder. Identify family and friends as support. Insight is commonly lost early in an impending episode. It can be helpful for friends or family to recognize typical bipolar symptoms; they can assist you in seeking treatment if necessary. An episode of either depression or mania usually disrupts daily routines as well as work, school, and home life. People may feel that life will never be the same. They may also feel unable to assume previous responsibilities and involvements. These feelings are natural and understandable. Yet, once properly stabilized on medication, most individuals with a diagnosis of bipolar disorder can return to their previous responsibilities and activities. Planning appropriate goals and setting priorities are essential to making this transition successful. Each plan and set of priorities is individual. However, it is important to discuss your ideas and concerns with your psychiatrist. Taking on too many or too few responsibilities can have a definite impact on recovery. Sometimes, people are advised to discuss their plans with other professionals, for example, an occupational therapist, social worker or psychologist. Family members may also need to know about your plans and concerns. Family can give important support and feedback as people resume responsibilities. The aim is to get the “just right” type of challenge. This is true whether people are returning to school or work, or taking on roles within their family and community. If you are planning to return to school, you should discuss this with your psychiatrist and/or mental health professional (e.g., occupational therapist or social worker). Some people find part-time studies a necessary step. Many people experience problems with concentration and memory. Look for ways to improve or adjust your study habits. Study for shorter periods of time and avoid noisy or high-traffic areas. An inability to block out the surrounding sights and sounds is common. Sharing the nature of some of your difficulties with your teacher may be helpful. Many schools and most colleges and universities have a “special needs” office that may also be helpful. A counsellor at this office will ask about the reason for your absence. This information will help the counsellors work with your teachers and instructors. A counsellor can suggest the best change to a course load and responsibilities. Sometimes it may be helpful to give permission to these counsellors to speak with your health care providers. Returning to work may also include similar challenges and careful planning. It is important to discuss your plans for work with your psychiatrist. You may also need to discuss your concerns and plans with an occupational therapist who can give you additional advice and support about your return to work. Gradually assuming your responsibilities by either starting part-time or with a lessened workload is highly recommended. Your health care provider may recommend specific job accommodations to your work responsibilities and schedule that may also be helpful in this transition. Typical job accommodations include: more frequent breaks, time off to attend medical appointments and a change in non-essential job duties. Educating your employer and co-workers about some of the typical signs of mood changes may be helpful in some cases. However, some people prefer not to discuss their illness with employers. Although this will not allow for the opportunity to ask for any job accommodations, it does not mean that you will be unsuccessful in your transition back to work. Having support outside of work, to discuss your problems and concerns, can be especially important in this situation. Regardless, each situation calls for an individualized plan and support. Home and community duties may also need to be resumed on a gradual basis. People must find that “just right” challenge of responsibilities and involvements. Reviewing priorities and developing a plan to resume activities may also be necessary. Look at what you can and have been doing, and plan accordingly. What you are currently able to do may not match what you were able to do in the past. Although this may be frustrating, set daily goals and monitor your accomplishments. Reflecting on and modifying your expectations is often an important part of this process. In the early stages you may need to rely on family members to absorb some of the household and daily responsibilities. As recovery continues, you can gradually resume your responsibilities. Learning to recognize and respond to any subtle mood changes is important. This is true when returning to school, work, or home and community involvement. Focusing on ways to concentrate better and work more efficiently may also help. Individuals may benefit, too, from decreasing some of the external stresses in their environment. set goals to address these mood changes, for example, make sure you are involved in enjoyable activities with individuals who support you. making decisions impulsively (more than usual). set goals to address these mood changes outside work, for example, find how to work off your extra energy safely with hobbies, exercise, etc. try to become aware of what times you perform best during the day. What Happens When Someone You Love Has Bipolar Disorder? When a family member has a chronic illness, it affects your entire family. It is not just the person with the illness who suffers. This is true of a physical illness, such as diabetes, or a mental illness, such as bipolar disorder. When your relative or partner has a mental illness, you must cope with extra stressors. People are learning more about mental illness and becoming more aware of it. Yet a certain amount of stigma remains. 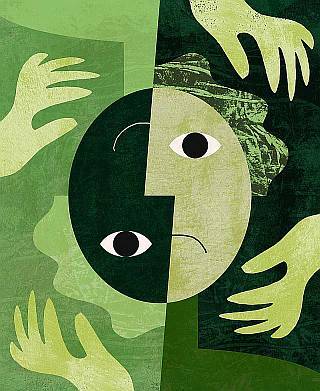 Fearing prejudice, your family may try to deal with mental illness alone. Furthermore, bipolar disorder will affect your relative’s mood and behaviour. At times, your family member’s mood disorder can make him or her less able to manage the illness, and he or she may become less willing to work with you in solving problems. As a family member, you will likely find both the manic and depressed phases of the illness very distressing. Your family member may have only mild mood swings. If so, you may be able to get through them without too much trouble. If, however, your relative’s mood swings are severe, you will likely find them very hard to handle. Watching a loved one struggle with depression can trigger many feelings in those who are close to the person. These feelings may range from sadness, concern, fear, helplessness and anxiety to guilt and anger. All depressive episodes are upsetting. It is likely, though, that your family member’s first episode will be the most confusing. You may not understand what is happening and why your relative is not getting better on his or her own. As a family member, you need information about depression. Without it, you may assume that your relative is lazy; you may give well-meaning advice and become frustrated and annoyed when your relative does not act on it. If your relative or partner talks about suicide, you will understandably live with a lot of worry. Family members often do not know how to talk to a depressed person. They may be afraid to ask too many questions and upset their loved one without meaning to. At the same time, family members do not want the ill person to feel that they are not interested or are avoiding him or her. Try to support and understand your relative. Be as patient as possible. Just recognizing that depression is an illness can help your relative to feel less guilty about not functioning well. Speak in a calm quiet voice. Focus on one subject at a time. Your family member may have trouble concentrating. Be patient and wait. Your loved one may take a while to respond. Your ability to listen is valuable to your relative or friend. Depression causes people to talk a lot about how bad they feel. Yet they may not be ready to discuss how to solve their problems. Listening and letting the person know, in a neutral way, that you have heard what he or she has said is valuable and supportive. You do not have to offer solutions. If the person is irritable, you may need to slow down, expect less and use a very non-threatening approach. Neutral comments about the weather, what you are making for dinner or other routine subjects are the safest way to develop a dialogue. Listen for chances to acknowledge or add to your relative’s responses. At these times, talking about important choices or issues is unlikely to produce results. You may need to plan to discuss important issues later. Avoid quizzing people about what made them feel depressed. Do not blame them for the way they feel or tell them to snap out of it. Moderately depressed people may hear what you suggest. Yet they may be unable to act on your advice. Quizzing or blaming them will only make them feel more guilty, lonely and isolated. Often, depressed people do not know what made them depressed or what will help. Pace yourself. If your family member is severely or more chronically depressed, it is normal for you to find his or her company very draining. Brief, frequent contacts with a severely depressed person are often best. If your relative is hospitalized, family members might take turns visiting the patient. How a person behaves during a manic episode stirs up intense feelings in everyone, especially family members. You may feel frustrated and annoyed, or you may even feel anger and hatred. The strength of your feelings will depend on how severe the episode is. Particularly frightening in a manic episode is if your family member, as you know him or her, seems to be replaced by a stranger. For example, a reserved, responsible woman can become loud and sexually free; a kind, gentle man can become bossy and cruel. As well, the manic person usually thinks that he or she is right and everyone else is wrong. This aspect of mania challenges families and others around the manic person. Your family member may take no responsibility for what he or she says or does. As a result, there may be times when you have to bail out your relative. Moreover, your relative can be acutely sensitive to weaknesses in others and can behave in ways that embarrass them. The severely manic individual can easily blow up. Being with someone who is severely manic has been compared to walking in a minefield - one never knows when there will be an explosion. Hardest of all, when your family member is manic, he or she may have no insight into his or her manic behaviour. If your spouse or partner is manic, you may find it very hard because you, more than anyone, may suffer from his or her anger. You may become a buffer between the person and the community as others demand that he or she be controlled. If your spouse or partner runs up large bills, you may be hounded by creditors. Some severely manic people have extramarital affairs, which they may flaunt. If this happens, you may feel humiliated and betrayed. Withdrawing from your spouse or partner and considering divorce may seem the only ways out of an intolerable situation. You should not make big decisions, such as whether or not to divorce, when the person is severely ill. The situation will probably change when he or she has recovered. Early in a manic episode, the individual may be overly happy, energetic and outgoing. Those around the person can easily be caught up in the high spirits. Stay realistic and do not get carried away by this high mood. A person who is manic feeds on attention and conflict. Try to discourage the person from becoming involved in stimulating situations, such as long talks and parties. Only a small percentage of people with bipolar disorder experience severe mania. In severe mania, the patient may become hostile and suspicious. He or she may even explode verbally and physically. Avoid arguing with someone in this state. The person will only become angrier and may even assault you. Typically, manic individuals may behave without being aware of or considering the dangers to themselves and others. They may take on risky business ventures, overspend, drive recklessly, etc. You may need to step in. The best way of preventing this kind of behaviour is to plan for it when your relative is well. During periods of stable mood, discuss and set rules that may involve safeguards. For example, consider withholding credit cards, banking privileges and car keys. Hospitalizing a person with mania can save his or her life. 1. Reduce stimulation. People with mania are easily overstimulated. You may need to have fewer people visit at the same time. Or you may need to lessen noise and activity in the house. 3. Deal only with immediate issues. Do not try to reason or argue. 5. Try not to be authoritative. Yet be firm, practical and realistic. 6. Do not jump to the person’s demands. 7. Do not get caught up with the person’s euphoria, or unrealistic expectations. 8. Do not try to convince the person that his or her plans are unrealistic. At the same time, take steps to ensure his or her safety (e.g., removal of car keys or credit cards). A partner or relative who is moderately depressed will probably agree to medical treatment without needing too much encouragement. Yet a person who is severely depressed and suicidal may refuse to be treated. This happens because the person feels so hopeless and worthless. In this case, you or someone the person trusts should insist that he or she see the doctor, even if the person protests. If your partner or relative does not have a doctor, go to the emergency department of the nearest hospital. You may see that your family member is becoming hypomanic, that is, acting more energetic than usual, sleeping less, talking a great deal. If so, you must encourage the person to see a doctor at once. That way, your relative can get medication to help calm down and stabilize his or her mood. For some people, hypomania leads to mania. If they are treated when they are hypomanic, they may avoid a full-blown manic episode. Once your partner or relative is manic, he or she may refuse to see a doctor. This is because the person will not think that he or she is ill. Families usually have a very hard time living with a manic person who refuses treatment and who cannot be legally hospitalized. Most jurisdictions in North America have mental health laws that make it hard to hospitalize people against their will. People can only be forced into hospital if they threaten to harm themselves or others, or if they cannot care for themselves. Most people will agree to go to hospital or to see their doctor. However, if a person refuses, you can then ask a doctor to make a house call and certify that the person must be hospitalized. If this is not possible, you can visit a justice of the peace. The justice of the peace will issue an order for a psychiatric assessment authorizing police to take your relative to hospital. The police are sometimes needed to get an ill person to hospital. Family members may agonize over whether or not to involve the police. They often feel very guilty about having contacted the police, even when the police were needed to protect the person’s life. Remember, when people threaten suicide, they are usually pleading for help. They should be taken seriously. Suicidal thinking is most often a temporary emotional state. During this phase, a person needs to be kept safe. Similarly, manic episodes can make a person behave dangerously with serious consequences. Manic patients are therefore best treated in hospital. Some people are very relieved when they are finally diagnosed and get a treatment that stabilizes their moods. For others, however, the road ahead is long and bumpy. Accepting that they have a disorder that must be managed over their life-span may be traumatic. Some people must endure several manic or depressive episodes before they consistently accept help from doctors and therapists. Mild mania can be seductive to some people because it often includes feeling happy, more confident, more energetic and more creative. It may therefore provide an ongoing lure to stop them from taking their medication. As a family member, you may find it very hard to watch this process. You may try repeatedly to convince your relative to “take your medication” or “go and talk to your doctor.” Trying continually to convince and coax can lead to heated arguments and power struggles. You may be very close to the person with bipolar disorder and yet feel that your views are unwelcome. In this case, it is sometimes more effective to have another trusted person approach your relative. When someone has a serious illness, family members naturally feel worried and stressed. They spend time comforting or helping their loved one. As a result, they may give up their own activities. Unsure of how others may respond to their ill partner or relative, family members may also avoid having friends visit their home. Over time, they may lose touch with their own network of friends. Or they may find that caring for their depressed/manic family member has replaced their own routines and activities. Often, people take a long time to realize how emotionally and physically drained they have become. This stress can lead to sleeping badly, or feeling exhausted or irritable all the time. Recognize these signs of stress in yourself and look after your own physical and mental health. Finding your own limits and making time for yourself are key to “self-care.” Try to create a support system of friends and relatives you can rely on. Think about people you might want to confide in. Mental illness is hard for some people to understand. Be selective and confide only in people who will support you. Consider having your own professional support. You could also join a self-help organization or relative support program. Local hospitals or community mental health clinics may offer such programs. Keep up your interests outside the family and apart from your ill relative. Acknowledge and accept that at times you will feel negative about the situation. These feelings are normal - try not to feel guilty about them. Families often avoid talking to their relative about relapses or crises. They fear that talking about a crisis will bring one on, or they simply do not want to upset their relative. As well, everyone hopes that the last crisis was an isolated incident that will not recur. The best way to handle a crisis or possibly avoid it is to know what to do before it happens. While focusing on wellness, some planning for recurrence can help both the ill person and the family to feel more secure. Could you both visit the physician to discuss your relative’s condition and how to deal with a possible crisis? Do you have advance permission to contact your relative’s doctor if your relative falls ill? Has your relative consented to your taking him or her to hospital? If so, which hospital has your relative chosen? If your relative becomes unable to decide on treatment, does he or she agree that you can make that decision? You may want to write down the terms that you and your partner or relative have agreed on. This can help to ensure that the terms are followed. Building a good relationship with the treating physician and having a pre-arranged emergency plan can also help to avoid a crisis. Learn as much as you can about bipolar disorder - its causes, signs and symptoms, and treatment. This will help you to understand and support your family member in his or her recovery. Acknowledge and accept your own feelings. You may feel sad that the person has a mental illness. You may feel angry that this has happened to your relative and seriously affects you as well. And you may fear what the future holds and worry about how you will cope. If you are a parent, you may feel guilt - that somehow you caused the bipolar disorder, even though the doctors have told you otherwise. It is also normal to experience a deep sense of loss when your relative is behaving in ways that you do not recognize. You may feel burdened by the extra tasks you have to take on. Having conflicting emotions is normal when a loved one is diagnosed with bipolar disorder. Knowing this can help to control these emotions when you want to support your relative in making steps toward recovery. Encourage your family member to follow the treatment prescribed by the physician. If your relative is not improving much on the medication or is having uncomfortable side-effects, encourage him or her to speak to the doctor or get a second opinion. Going with your relative to the physician to share what you have observed can help a lot. Learn the warning signs of suicide. These include feeling increasing despair, winding up affairs and talking about “When I am gone ... .” Take any threats that the person makes very seriously and get help immediately. Call 911 if the situation gets desperate. Recognize, and help your family member to see, that suicidal thinking is a symptom of the illness. Always stress how much you value the person’s life. When your family member is well, plan how to try to avoid crises. With your family member, work out how to respond to periods of acute illness. Planning should include how to deal with suicidal behaviour. It should also cover how to prevent harmful results of manic behaviour, such as overspending or reckless driving. - stop bipolar disorder from taking over family life. Support recovery from an episode by recognizing that it is slow and gradual. Know that your family member needs to recover at his or her own pace. Try not to expect too much but avoid being overprotective. Remember that stabilizing mood is the first step towards a return to normal functioning. Try to do things with your relative rather than for him or her. That way, your relative will slowly regain self-confidence. View your family member’s bipolar disorder as an illness, not a character flaw. Treat your relative normally once he or she has recovered. At the same time, watch for possible signs of recurrence. In a caring way, point out the early symptoms and suggest a talk with the doctor. Learn, with your family member, to distinguish a good day from hypomania and a bad day from depression. Like everybody else, people with bipolar disorder have good and bad days that are not part of their illness. Explaining mental illness or bipolar disorder to children can be awkward and difficult. To protect their children, the affected and well parents may say nothing and try to continue with family routines as if nothing were wrong. This strategy may work in the short term. Over the long term, though, children can feel confused and worry about how their parent’s behaviour has changed. Children are sensitive and intuitive. They quickly notice when someone in the family has changed, particularly a parent. The atmosphere in the family may not encourage talk about this subject. If so, children will draw their own, often wrong, conclusions. Young children, especially those in preschool or early grades, often see the world as revolving around themselves. If something bad or unpleasant happens, they assume they caused it. For example, a child may accidentally break something valuable. The next morning, the parent may seem very depressed. The child may then assume that breaking the object caused the parent’s depression. Children need to have illnesses explained to them. It is best to give them as much information as they are mature enough to understand. For example, toddlers and preschool children understand simple, short sentences. They need concrete information and not too much technical language. It is best to explain simply and then try to normalize the situation. Moving on to do something special that the child enjoys can make things feel better for the child. School-aged children can process more information than younger children. Yet they may be overwhelmed by details about medications and therapies. Teenagers can generally manage most information. Often, they need to talk about their thoughts and feelings. Teenagers worry a lot about what other people, especially their peers, will think of themselves and their families. They may ask about genetics. They may also wonder how open they should be about the situation and worry about the stigma of mental illness. Sharing information encourages talking further. The parent or family member behaves this way because he or she is sick. Bipolar disorder makes people feel one of two ways. They may be very depressed, or sad, sometimes for no reason. They may cry a lot, sleep all day and have trouble eating or talking to people. At other times, they can become very loud and happy. Small things can irritate them and make them angry. Children need to know that they did not cause the illness. Children need reassuring that they did not make the parent or family member sad, angry or happy. They need to be told that their behaviour did not cause their parent’s emotions. Children think in concrete terms. If a parent is sad or angry, children can easily feel they did something to cause this, and then feel guilty. Bipolar disorder needs to be explained as an illness. It just like having the chickenpox or a bad cold. Children should be reassured that it is not their responsibility to make the ill person well. Children need to know that the adults in the family and other people, such as doctors, are working to help the affected person. It is the adults’ job to look after a person with a mood disorder. Children need the well parent and other trusted adults to act as a protective buffer between them and the parent’s symptoms of depression and mania. It is very hard for children to see their parents distressed or in emotional pain. In the same way, children have trouble coping with the irritability of a parent struggling with mania. Talking about what they have observed and experienced with someone who understands the situation can help sort out the child’s confused feelings. Many children are scared by the changes they see in their parents. They miss the time previously spent with this parent. Taking part in activities outside the home helps because children are exposed to other healthy relationships. In time, as the ill parent recovers, gradually resuming family activities can then help mend the relationship between the children and the affected parent. Both the ill and the well parents should talk with the children about explaining the illness to people outside the family. Support from friends is important. However, bipolar illness can be hard to explain, and some families are concerned about the stigma of mental illness. Each family must choose how open it wants to be. Finally, some parents struggling with bipolar depression may not be able to tolerate their children’s noise and rowdy play, even though such disturbances are part of children’s everyday activities. Special measures may be needed to buffer the ill parent from situations that may lead him or her to be irritable and abrupt with the children. At times, children may need to play outside the home. Or the ill parent may need to rest for part of the day in a quiet area of the house.